Who can be baptised at St. Oswald’s? 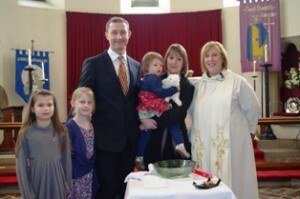 At St Oswald’s we are very happy to christen (baptise) anyone who lives in the parish. Occasionally we also baptise people from outside the parish – please be in touch to discuss this with the Vicar. We are happy to baptise adults as well as children – parents and godparents of children being baptised often choose to be baptised at the same service. All major christian churches recognise each other’s baptisms: parents and godparents can be baptised members of any christian church. Baptism is the beginning of the Christian journey. At our baptism we are given the precious gift of God’s indwelling Spirit who gives us strength and spiritual gifts to help us live our lives as Christians. Praying for and with your child through the ups and downs of their faith journey. Bringing your child to church on a regular basis. St. Oswald’s is a very child-friendly church – we love children even when they cry or have the terrible twos! If you decide to be baptised as an adult you are making a decision to follow Christ. If you make this decision you need to make a commitment to attend church regularly – this is where Christians learn more about their faith and encourage one another – being a Christian is not always easy! When you come to book your Christening you will be given a date for a preparation class – normally two Wednesdays before the service. Parent(s) and as many Godparents as possible should attend. It is essential to attend a preparation class before the christening can take place. There is no charge for a Christening but we do ask that you give as generously as you are able to St. Oswald’s. It costs around £50,000 each year to keep St. Oswald’s open and all this money comes from people who come to church and our fundraising events. At the moment we are struggling to pay our way so your gift is important. If you are a taxpayer it helps us if you gift aid your donation. This will be explained at your Baptism preparation. Godparents should be people who’ll be in touch with your family for many years to come. They may be relatives or friends of the family.They’ll be people who you know you can trust and who’ll be there for your child to talk about the bigger questions in life; questions about faith, hope and love.They should feel ready to make some big promises about faith for your child in church. They should be prepared to nag you if you get out of the habit of bringing your child to church! Normally, children have at least three godparents – more if you wish. Because of the very special role they have in supporting your child’s faith journey, godparents must be baptised themselves. At St. Oswald’s we are happy to baptise Godparents-to-be at the same service. If you are unsure about who to choose as Godparents please come and talk to the Vicar. If you cannot find suitable people to be Godparents we can find church members to step into this role for you. For children, a children’s’ Bible or prayer book is a really good idea. This will help the parents to begin to put into practice the promises they will make during the Baptism service. Please make sure that you don’t buy a Bible which is in old fashioned language with no pictures – these are offered in special Christening editions and are beautifully presented but are not at all suitable. The Children’s Society offers a range of christening gifts, including a stunning Bible story book, with stories re-told by Archbishop Desmond Tutu. By buying from you support their work with vulnerable children and young people in our country. Information on the gifts can be found HERE. If you would like to know more about christenings, lots of information can be found HERE. Here’s a pic from Baptism Sunday 1st November 2015, when we had the pleasure of formally welcoming Ethan and Lochlan to the church. Looking good guys!